The Marcy Case is the first Expansion for T.I.M.E Stories, though I really wish it had been included in the base game. It's a set of large format cards that add a completely new time travelling adventure to the original game. You'll be sent back to 1992 to find Marcy, a young girl who for some reason is important to the future world. The aim is to keep this review spoiler free, but some mild spoilers will have to creep in to discuss the expansion. So from this point often there will spoilers, you have been warned. 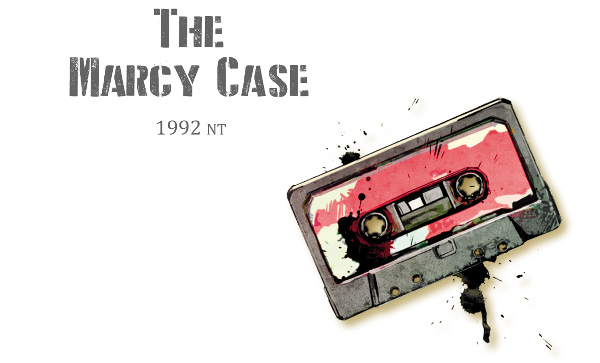 Sorry I had to get that one out of the way as soon as possible, because the Marcy Case is a mystery centred on a Zombie Apocalypse in the US. There an extremely strong The Walking Dead influence here, not only in the plot but also in the comic book art style. I have to draw attention to the art style because it is so completely different than the art in Asylum that it immediately sets itself apart. And it’s not the only thing that’s different, due to fighting off the undead there’s a different approach to the way skills work. Receptacles now specialise in two kinds of fighting, hand to hand and ranged, as well as investigation. There is also a simple but effective ammo system whereby not only is ammo limited but every time you use a firearm you make noise that can attract more zombies. This makes combat much more interesting than in the Asylum, as every round of combat has a potential negative knock-on effects. The mystery behind The Marcy Case is also of a different flavour to the Asylum. Not only is it meatier, having significantly more cards, therefore more locations, more items and a more tangled web of clues, it's also has a more investigative mystery, relying more on gaining clues and talking to the right people rather than solving a fiendish puzzle. Unfortunately this does mean it's more of a bread crumb trail and also means that if you get stuck it's more likely that you've missed a clue rather than because you can't work it out. One of the more pivotal moments comes from a very particular interaction that we didn't discover until the 5th run. However, there is an end condition that has a few different routes to complete. My biggest problem with The Marcy Case is largely the same as my problem with the Asylum, it requires doing everything, talking to everyone, picking up every item and, eventually, finding the correct solution. It means the mystery is more of an exercise in memory, luck and trial and error. It would be nice if you could shortcut some of the exploring via clever interpretation of the clues, but it's entirely possible that you can do this but my game group and I are just too stupid to have spotted the signs. Even with all my issues, this was still great fun and an amazing experience. The Marcy Case had us talking, laughing, joking and blaming the player who came up with the wrong idea. It maintained the intensity and team playing of Asylum and cemented in my mind that TIME Stories is the best gaming experience I have had this year. It has moved TIME Stories up my game of the year lists even further but issues with the cost that I highlighted in my initial review still remain. Thank You for 100,000 pageviews!